Beijing's Olympic organizing committee said Wednesday it did not know that top Hollywood director Steven Spielberg might be planning to resign as an artistic adviser to the 2008 Games. 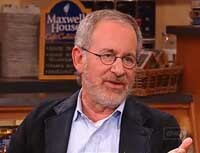 Spielberg sent an open letter to President Hu Jintao in April urging China to take a harder line against Sudan over the Darfur crisis, and last week ABC News and other U.S. media cited the director's spokesman Andy Spahn as saying he was considering dropping out of the Olympics because of China's inaction over the crisis. At a news conference Wednesday, Zhao Dongming, director of cultural activities for the 2008 Beijing Olympics organizing committee, was asked to confirm Spielberg's possible exit. "I was not aware of that," Zhao said. "I had not heard of that." More than 200,000 people have died and 2.5 million have been uprooted in the ethnic conflict in the Darfur region of Sudan. China, which imports two-thirds of Sudan's oil and sells arms to Khartoum, has been criticized for supporting the African nation, and has opposed United Nations sanctions. The U.N. unanimously agreed Tuesday to send a 26,000-strong peacekeeping force to Darfur no later than the end of this year.